Club Car Precedent makes a great golf cart for many different uses. They’re great for the course or would the simple addition of a back seat that flips down you can use them to all my friends and family around your property or neighborhood. For some though 4 passenger golf cart isn’t enough, that’s where we come in. 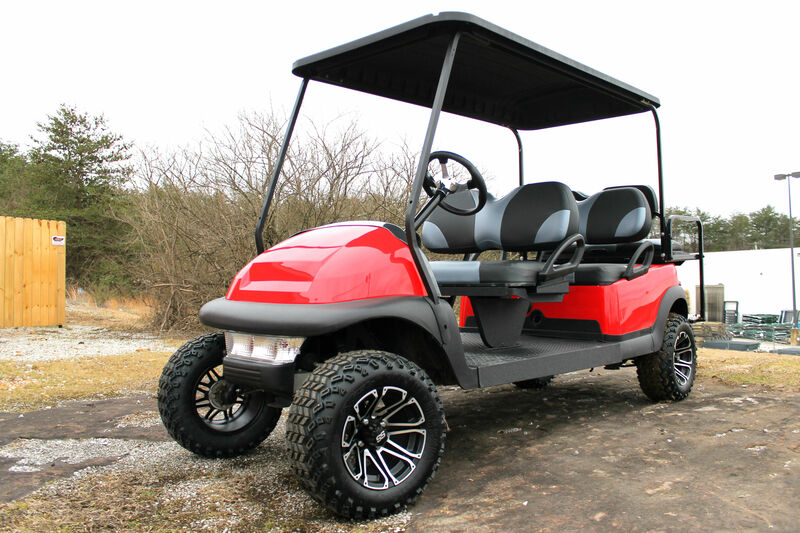 We can take any Club Car Precedent golf cart and turn it into a 6 passenger golf cart. Now even if you have a big family, you can all enjoy a ride in your cart at the same time comfortably. The stretch kit we install comes with heavy duty frame members the provide plenty of support for the new stretched cart and the added weight. You don’t have to beef up the drive system, but here we like to go above the minimum. The cart shown here has a 420 amp Navitas controller. This controller offers on the Fly programmable settings for speed, acceleration, and regenerative braking. Even with the added weight of the 6 passenger golf cart with passengers, this controller gives your motor enough power that it will set you back in the seat when you take off. With the higher amperage even steep hills are easy to climb.